That's a huge revelation. Now that we know why most tech companies fail, we can learn from their mistakes. The cure sounds easy. Don't scale too early or too quickly. The problem is that you don't know when to scale (or when not to scale). That's where financial metrics come in. Instead of relying on a gut feeling to decide you've found product/market fit, you're going to let the numbers show you. Instead of hoping that you have a repeatable sales model, you're going to let the numbers show you. Sound easy enough? Not so fast. It gets a little trickier for Software as a Service (SaaS) companies. We'll detail some of the differences below, but you should understand up front that financial metrics for SaaS companies are different than most other types of companies (and not necessarily in a good way). The subscription billing metrics used in well managed SaaS businesses are more complicated. But we're going to help you understand it all. In fact, we're going to tell you up front something that most SaaS founders wish they had heard early on. Focus a lot of resources on revenue recognition. Your valuation at your next capital raise and at exit will depend on it. More on that in a bit. One of the common questions we're asked is "Do I really need SaaS metrics? Don't regular Generally Accepted Accounting Principles (GAAP) financials work just fine?" Without a view into a firm's unit economics (the cost to acquire a single customer and what profit that customer is expected to bring in over time), you wouldn't know if or when the company even has the ingredients required to become profitable. Another area where GAAP financials fall short is understanding churn and revenue composition. GAAP financials don't provide visibility into when customers churn or the makeup of your revenue. It's really challenging to manage a SaaS business without clarity on these important factors. So how do you know which metrics matter most for a SaaS company? To help frame the question of which SaaS KPIs to watch, we're going to discuss metrics by phase of growth. During each phase, you will focus on some metrics more than others, though you should keep an eye on several KPIs other than the ones listed below during each phase. Phase 1 - Achieve product/market fit. In this phase, you confirm that you have a product that customers will pay for and that you've found a market with enough hungry customers to sell to. [Future] Phase 2 - Build a repeatable, profitable sales process. In this phase, you refine your sales process and ensure that you can make a profit. [Future] Phase 3 - Grow the sales engine as fast as possible. 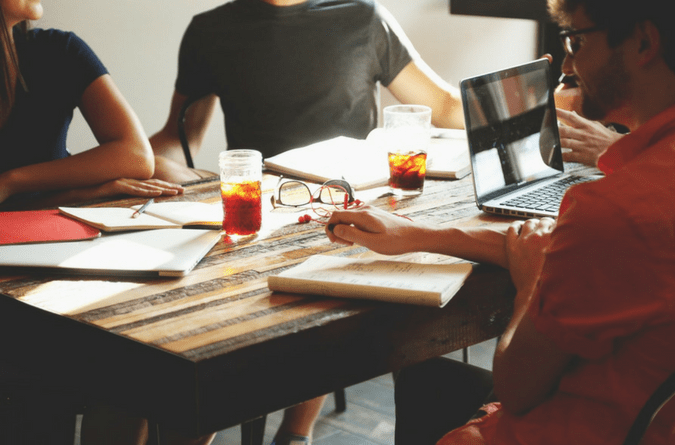 In this phase, you aggressively scale your sales efforts and team and solidify your processes. This is Part 1 of a three-part series. We'll cover the metrics to watch in Phase 1 in this post, and address Phases 2 and 3 soon. Let's start with Rule #1 of business--don't run out of cash. All the SaaS metrics in the world can't change an empty bank account. If you have a clear cash picture, you'll know if and when you might run out and you will have enough time to raise more money before you hit the bottom. We always stress that it is important to make your financial dashboards visual. As an example, let's take a look at a Cash Burn Rate & Runway view. We use this historical view into the cash position because it provides what you need to know on a single page. The bars show your cash burn for each month. The blue line shows cash burn rate as a trailing three months average. This three-month calculation is an excellent guide for projecting the future because it takes into account the swings that can occur on a month-to-month basis. The red line gives you how many months of cash you have in the bank at your current burn rate. The ending cash balance is tucked into the data table under the chart. Now let's preview a forward-looking cash flow projection. Projecting cash is not unique to SaaS, but some of the wrinkles are. 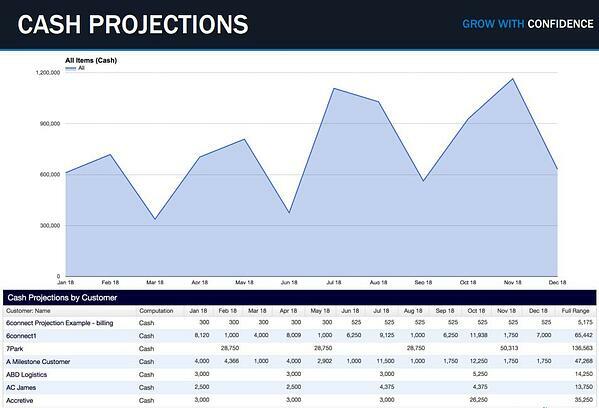 To get a complete cash projection, you need to be able to roll forward your existing business at an accurate rate and add new estimated business. This kind of forward-looking view is impractical in a home-grown Excel or Google Sheets model, so we highly recommend a product like SaaSOptics to get the kind of data illustrated below accurately and quickly. 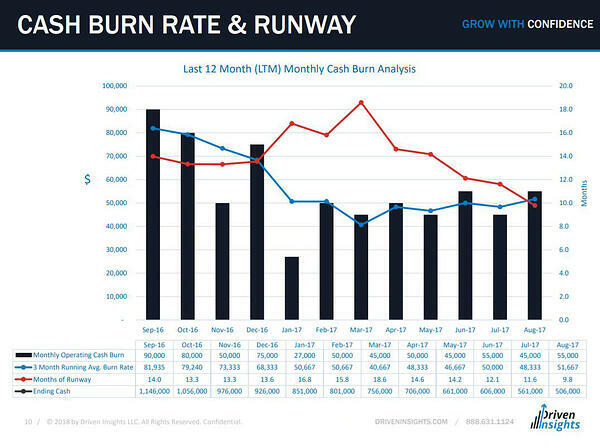 Combine this chart with the Cash Burn Rate & Runway data, and you get a powerful way to manage your burn rate. Getting a clear picture of Annual Recurring Revenue (ARR) through accurate revenue recognition is one of the trickiest parts of SaaS accounting. It's so tricky, in fact, that second-time SaaS founders often say that it's the top item they will nail in their second go round. Accurate ARR is one of the first things a potential buyer or VC will look into, and problems here often lead to severe devaluation or even a buyer walking away from the table. 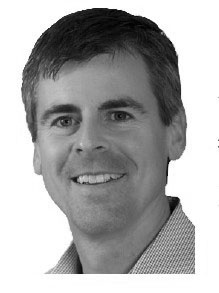 Accurate ARR is one of the critical metrics where revenue recognition comes into play. Revenue recognition is one of the primary building blocks of SaaS metrics. 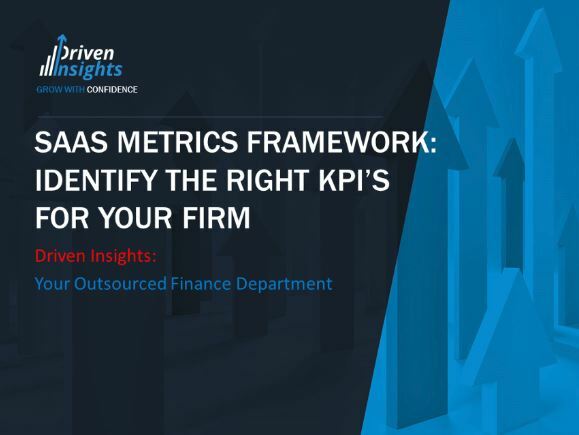 If you fail to track your firm's revenue accurately, the other metrics just don't follow. Revenue recognition means matching revenue with the period in which it was earned. This is difficult in SaaS because you often have customers paying for services before they are delivered, and those time differences can vary from customer to customer. You may have some customers paying three months ahead and some on three-year plans with annual advanced payments. Revenue recognition normalizes bookings across a period. Properly recognized revenue provides visibility into your revenue composition which is required if you want to know where to focus to optimize it. Well-managed recurring revenue businesses have the potential to fetch huge valuations. Therefore, ARR is one of the biggest drivers of valuation, but you have to get it right. It is possible to track revenue in a spreadsheet early on, but it quickly gets to a point where complexity leads to inefficiency and human error. Reporting is very limited, and cohort analysis and other types of segmentation just aren't practical. So, again, a spreadsheet may be fine for a short period, but you'll want to check out a solution like SaaSOptics to get accurate financials while you're still in the product/market fit stage. FYI, private companies will have to follow new Revenue recognition guidelines beginning in 2019. SaaS businesses rely on repeat customers. As opposed to other industries like retail, it's not enough to get a customer to buy one time. If you can't get them to continue buying, you haven't achieved product/market fit. When you confirm that you have customers renewing by tracking the renewal rate SaaS metric, you know you've found the right pool of customers and that you're delivering something valuable. Then, you can begin to work on profitability and scaling. Ensure your customers are renewing and that the addressable market is sufficiently sized. In other words, ensure there are plenty of companies like your existing customers who you can reach. One important note is not to count customers sold by the founder. The founder usually has a greater ability to sell the service than an average salesperson would and may have found some out-of-the-ordinary customers (early adopters) to sell to. Instead, only count average customers who have been sold to by average salespeople in your renewal rate analysis. With a firm understanding of some of the primary financial metrics for SaaS companies in Phase 1, you've taken the first step in steering your SaaS ship through the choppy waters of product/market fit. Now it's time to take this knowledge and put together your own SaaS metrics reports by tracking Cash Burn Rate & Runway, Accurate ARR, and Renewal Rate, as well as a few others. We've developed an example framework to help you get your reporting the proper structure. It's available as a free download.